Arctic countries are my favorite destinations as I perceive Arctic landscapes as purest and most aesthetic. Human population and thus, impact on nature, is low which is the prerequisite for pristine experiences enchanting and capturing me when going there. 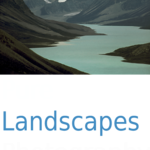 Browse through the Arctic landscapes portfolio by selecting from one of the categories above. The Quallunaat have begun to destroy life. if you take action against them. Comprehend them as part of you. Each individual is another one’s "extraterrestrial"
on this totally interwoven planet. instead of fighting against them.